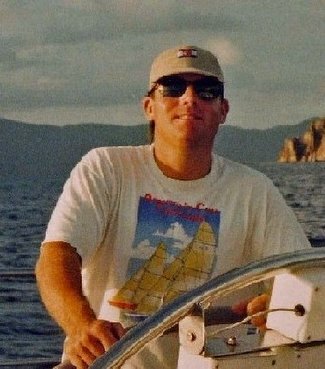 This may be pushing the bounds of virtual fun & games but yes, there I am - or rather there's the Avatar "Lex Lian" sitting on the transom of a Tako II in a virtual marina sipping a cup of coffee and getting ready for a romping sail. Cost to purchase the racing dinghy...only $250 Linden (less than $2.00 U.S.) Second Life has been getting a lot of buzz lately and, true to form, there's a lot of monkey business going on but imagine this...somewhere down the line when online 3D worlds get more immersive a virtual community of like-minded sailors might particpate in regattas, offshore delivery simulations, lectures and classes, etc. Maybe 15 years from now we'll sit in our home "entertainment room" surrounded by high def displays and networked into the America's Cup simulation in Second Life...or whatever it spawns. 15 years away..nah a lot closer than we might think.. or want! The training stuff is going on already, maybe not for sailing but for other stuff... the futures here... duck, the booms coming over! At the moment the experience is somewhat limited due to computing power but in my opinion we are seeing the leading edge of a technology that will change the face of everything - the analogy I like to use is think of the gap between the old reel to reel tape player I remember my Dad having in the mid 1970's and the ipod today. We could have never envisioned something like the ipod when we thought the reel to reel was the bees knees but the core concept of portable audio was there and in 20 years or so it was extrapolated out to the ipod...which one could argue is in and of itself just the leading edge of something we can't yet envision. The point being that the excitment around "Second Life" has to do - for me - with what I can imagine being able to to as the technology gets more powerful. 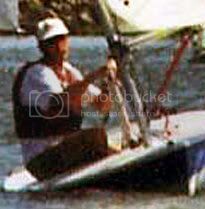 As well it's a cool way to interact more broadly with a community of (in my case) sailors. 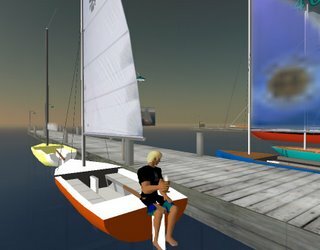 For what it's worth I watched the 32nd America's Cup in their sims in Second Life. The technology is already here.